Modeling a semi-infinite soil domain has always been a challenge, especially in problems where the interaction between the soil domain and structure domain is a dynamically responsive one, as in the case of seismic wave loading. 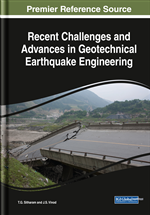 Under such conditions, researchers used various strategies to simulate, both physically and numerically, the behavior of pile foundations under seismic loading. While describing the challenges and hitherto applied strategies, two comprehensive numerical studies are described: one at behavioral state in terms of inelastic response spectrum and the other at the limiting state of collapse. The numerical modeling of seismic soil-pile interaction essentially consists of strategies for modeling the seismic wave propagation through soil, inelasticity and pore-pressure development in soil, nonlinearity at soil-pile interface, interconnecting soil and pile, and avoiding unrealistic reflections from truncated interfaces. In the following paragraphs, an attempt is made to review the existing strategies for modeling these phenomena. Continuum modeling of soil-pile system essentially consists of four components (Figure 1): pile or pile group with pile cap, interface between pile and soil, near-field soil that can undergo plasticity, and far-field soil that accounts for the stiffness and damping effects of truncated semi-infinite soil. This continuum modeling can be computationally expensive, but it naturally simulates the a) wave propagation effects, b) soil plasticity, c) soil-pile separation, and d) pile group effects (Figure 2). For practical or design purposes that neither need modeling the seismic wave propagation effects nor require pile group effects, the simple alternative of discrete modeling of soil using Winkler springs exists. Again, Winkler modeling can use static or dynamic p-y curves with or without dampers. For modeling radiation damping, more complex series of springs and dampers can be used (Nogami, Otani, Konagai, & Chen, 1992). In all discrete models, pile is modeled as a beam with rotational degrees of freedom. Figure 3 shows the typical details of such models, with the pile properties (modulus of elasticity E and linear density m of pile material, radius r0, cross-sectional area A, length L) and the near-field soil properties (soil density ρ, shear modulus Gs, radius of near-field r1 stiffness proportional damping ξk, mass proportional damping ξm). In fact, such models are derived on the basis of experimental results or continuum modeling.